Donald MacLeod: The pain of Spain falls mainly on the plane… so why not jump in the car and hit the road? FOR the dynamic and intrepid travelling duo Donald and Pauline MacLeod, there were no planes and no trains, it was an automobile and a huge boat we used on this year’s extended Iberian holiday. My 4×4 was packed and fully fuelled for our ferry voyage across the unusually tranquil Bay of Biscay. Asides from the unnecessary roadworks on the chaotic M6, and a minor meltdown in Madrid when I accidentally took not one but three wrong turns, it was a truly relaxing, unforgettable and enjoyable experience. So much so that, if given the chance, I would do it all again. It was absolutely brilliant. No getting stressed out at stupid o’clock in the morning, hours before your actual departure, as you make a mad dash to the airport. No driving around in circles, miles from the actual airport, trying to find a car parking space. No being forced to wait in the cold and dark on the packed transfer bus and then having to humph your luggage aboard, overheating with stress as you try and squeeze it on-board. No being barked at and herded like cattle by nippy airport staff in the departure lounge. No having to put your liquids, toiletries and cosmetics into clear plastic bags before going through security. As for the flight itself, you may be lucky enough to find an inch either side of you in which to manoeuvre – if you have paid for extra leg room. Even worse, you could find yourself on a flight full of pink and blootered Neanderthal zoomers flying out for a stag or hen weekend. And there is no parachute to escape them. On landing, feeling very sore, bruised and squashed you are then packed like sardines onto a runway bus which has no air conditioning. After an age, you are dropped off at a not-fit-for-purpose terminal, where you attempt to fight your way to the front of the queue for immigration control. EU freedom of movement? Don’t Make me laugh. 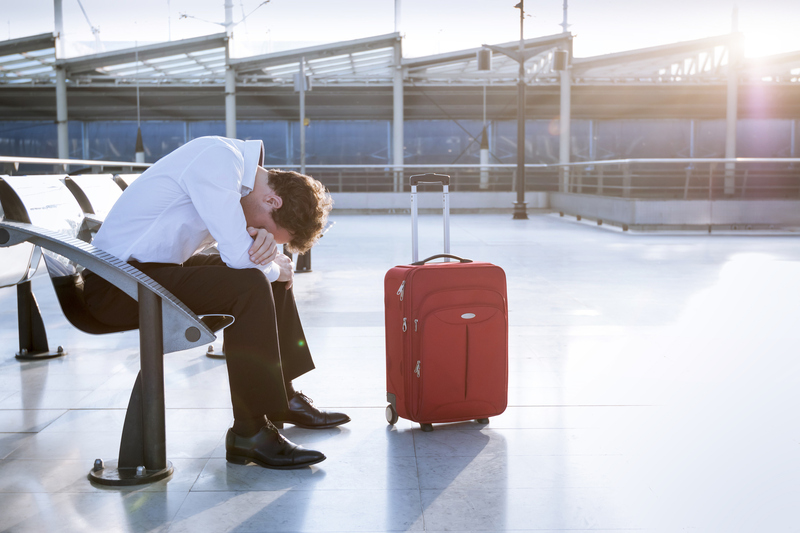 Exhaustive hours later, when you have finally struggled through to the other end and picked up your luggage – well, most of it, as we always seem to have a bag missing – you spend more time filling out lost luggage forms. Then you despair that there is no car waiting for you at the car hire depot, which is usually miles away and where a whole new level of hell awaits. So it’s clear that if you can afford the time, the costs can be cheaper than flying as there are no luggage charges, and if you don’t have greetin’ weans with you and don’t mind driving, and are not susceptible to travel sickness, then this is definitely the way to travel. A leisurely drive down to Plymouth, with a stopover at Bristol, a stress free and orderly queue at the port, security and passport control were efficient but a breeze. It was case of roll up and roll on and before you know it you were in your fully fitted cabin, with a double bed and en-suite shower room. Smart restaurants, bars, shops, cinema and there was even a swimming pool and spa area. Acres of space to while away the hours, take in the rays and watch the sunset. Then it was off to bed and when we woke up, showered, had breakfast and were feeling refreshed, the stunning Basque region of Spain loomed ahead. Before we knew it, we had disembarked at Santander, driven through customs and started our summer adventure in earnest. What a 3,000-mile road trip it was. Braganca, Viana Do Castelo, Lisbon, The Algarve, Serra Da Estrela, Evora, Estremoz, Madrid and Bilbao…castles, monasteries, mountain, vineyards (lots and lots of wonderful vineyards), beaches, Roman ruins. And of course wherever we went the World Cup was being screened in every town square, so the atmosphere was electric. It could have all been so different if the weather had turned when we were crossing the Bay of Biscay. It didn’t, so we just need to see if it does the next time. I hope not. If there was one thing that I was slightly narked at when we were away it was this: it was hotter here in Scotland than it was in Portugal and Spain! Eh? That’s just not on, it’s not fair. It’s meant to be cold, bleak and miserable here at home, especially during the summer and when I’m on holiday – this is not Costa del Scotland. I can’t be coming home to find some of my work-shy staff with better tans than me.